It is good to have special pants for special occasions. A party, a festive dinner, the beginning of the school year, friend's birthday - these are the moments when it is better to leave ordinary jeans or drainpipes in the wardrobe. 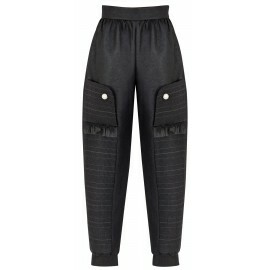 Instead, it is worth to give a chance to elegant girls’ pants by POCA & POCA, which will take you to the secret tropical world. To create them, we went to the very heart of the jungle to meet exotic butterflies and dragonflies. They flew freely over misty pond, rising drops of water up in the air. They stopped on large leaves and hid their heads in calixes of heaving flowers. They were full of peace, delicacy and lightness, but also emanated with dignity and class. From these impressions we woven threads of incredible ideas, which we used to create elegant girls’ pants worthy of a princess - but one that sometimes escapes from the ballroom to give in to the carelessness of children's play. 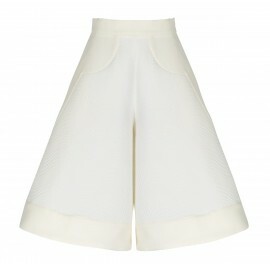 Following the voice of nature, we have opted for classic cuts that are both stylish and comfortable. 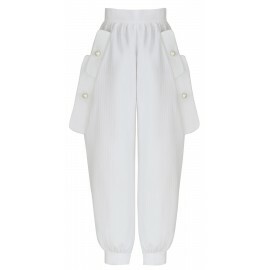 We designed pants for a girl with high waist.This model is a fashion must have also in wardrobes of young fashion-lovers - pants with high waist beautifully emphasize the waist, optically lengthen the legs and slim the figure, do not slide off the hips, and also match any accessories, creating unusual styles. 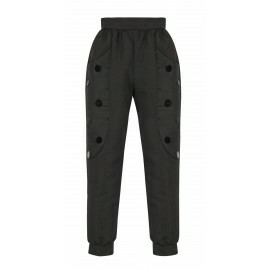 Knowing the habits and temptations of little girls and younger teenagers, we offered them comfortable girls’ pants with an elastic band on their legs (some models have legs with a button) - the pullers make the joggers always fit well, also minimizing the risk of stepping on the leg while walking. 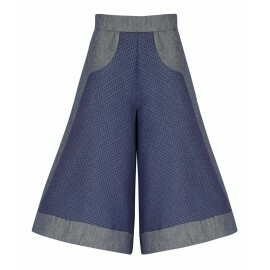 Girls who are eager to play around will also like girls’ banana-shaped pants and pants with straight legs, wider in the knees - both cuts provide adequate freedom and comfort. We wanted every young lady to feel exceptional in the POCA & POCA pants and as comfortable as an exotic butterfly carried with the breeze to the flowery lanes. 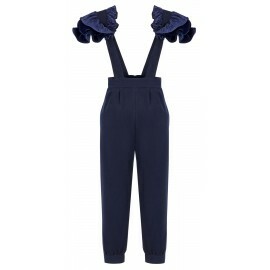 That's why the POCA & POCA collection includes elegant, high-waist dungarees decorated on the suspenders with wavy, subtly glossy frills, which resemble butterfly wings. 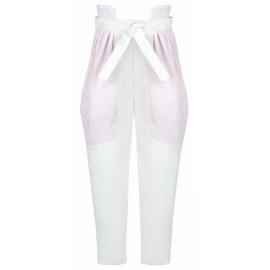 Girls’ blue dungarees have details made of pleated fabric, while pink dungarees in the colour of light cherries have frills made of smooth fabric. 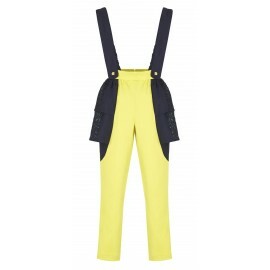 POCA & POCA girls’ dungarees harmonise with sophisticated blouses, e.g. those with transparent, wide sleeves, and with everyday, less sophisticated blouses. 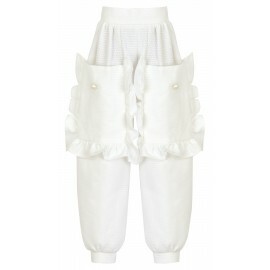 POCA & POCA girls' pants, inspired by exotic groves, are a classic broken with original details. 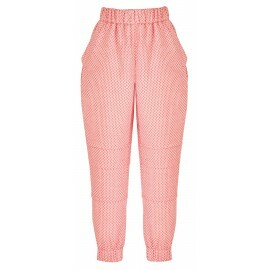 The collection includes elegant black, white, pink, crystal pink, navy blue and denim pants - a toned palette of colours will allow you to easily match any top and shoes with the pants. 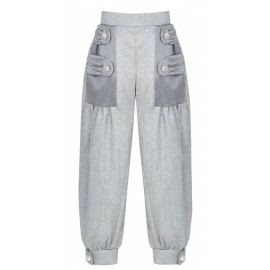 Each pair of POCA & POCA pants has also extraordinary ornaments. 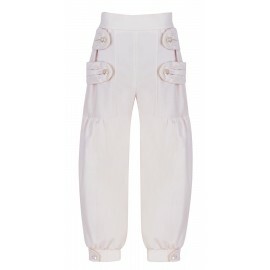 Among those you will find girls’ pants with flounces on the sides, pearl buttons, shining sequins, flaps or pockets. The background for the tasteful inserts is created by beautiful fabrics: smooth, textured, mat, slightly glossy and quilted. 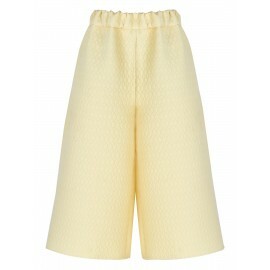 The materials arrange nicely, they are airy and feel nice to the skin. In order to offer the stylish pants to younger and older ladies, we made models that fit girls between 110 and 162 cm high, aged 4-14.